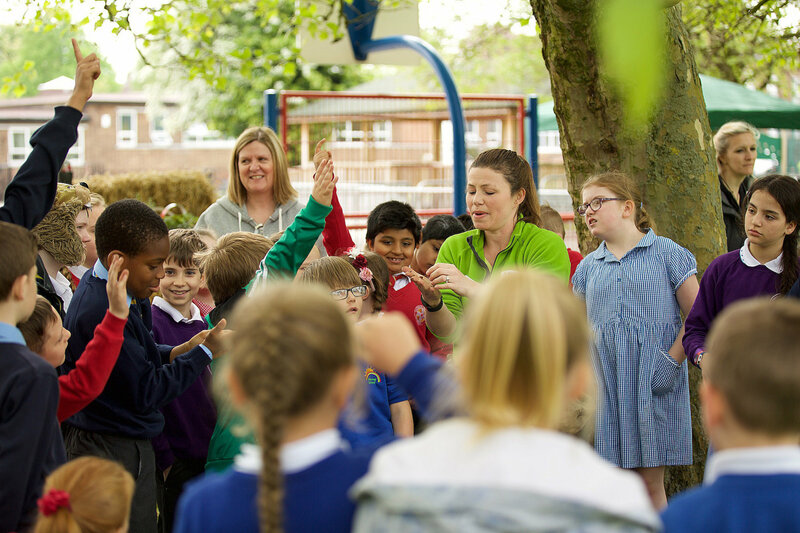 This is a case study to show how the Great Grounds Outdoor Learning Curriculum at Work Event had a positive impact on children and the curriculum they have in schools. 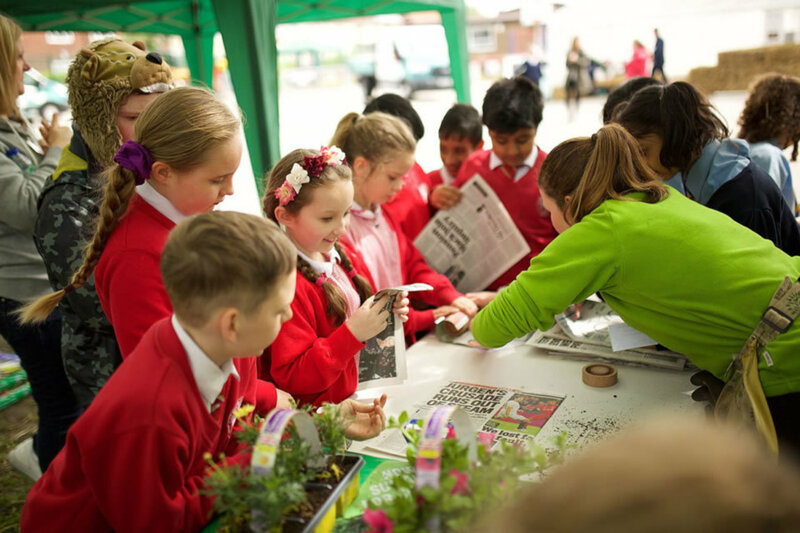 The aim of this event was to demonstrate to children the work they do in schools directly links to jobs and careers later in life. We also introduced the children to apprenticeships and jobs in the trade that are available to them. Each demonstration was also linked to curriculum such as maths and science. The demonstration took place on 19th May 2016 at Sacred Heart Catholic Primary School, Baugley and lasted for 4 hours. The children were from a range of year groups and schools. To start the day, five children from five different schools met in the registration area where we spoke to the children and teachers about the day ahead. We then moved on to the Tree Zone in which we discussed with the children the job of a Tree Surgeon. Following this, we showed the children all the Personal Protective Equipment (PPE) and asked them what it was for and how it could protect us. We then moved on to the tools a Tree Surgeon would use and discussed the differences in weight and effects on the environment between the electric and petrol powered chainsaws, relating to sustainability. 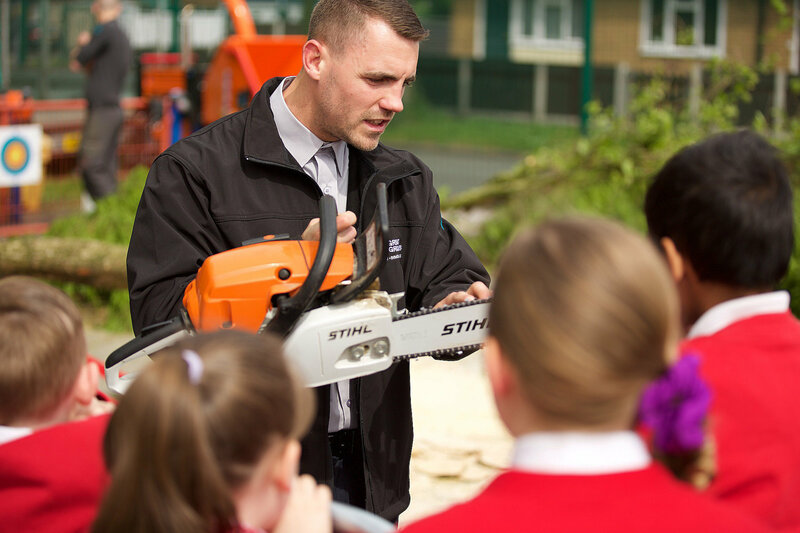 We then demonstrated to the children the chainsaws in action by cutting wedges of wood whilst discussing the differences in sound between the electric and petrol chainsaws. The children were very excited to see the chainsaws in action so we moved on to the chipper. Here we discussed the weight of the chipper, that is 1280kg, and how this could be converted to different weights such as 1.28t. we also discussed the length of the chipper that is 3561mm and how this could be converted into meters. Once the children had converted the weight and size we then turned the machine on and chipped some of the trees, which the children thoroughly enjoyed. We all then moved on to the Creating an Environment Zone where Mandy took over the demonstration. In this zone Mandy discussed with the children plants and insects and the relationship they have together and explored habitats, for plants and for animals. We built a bug hotel, using different materials such as sticks, cardboard and bricks in pallets, to demonstrate how different creatures require different places to live. We also talked about how you can quickly create mini habitats in your school’s grounds. 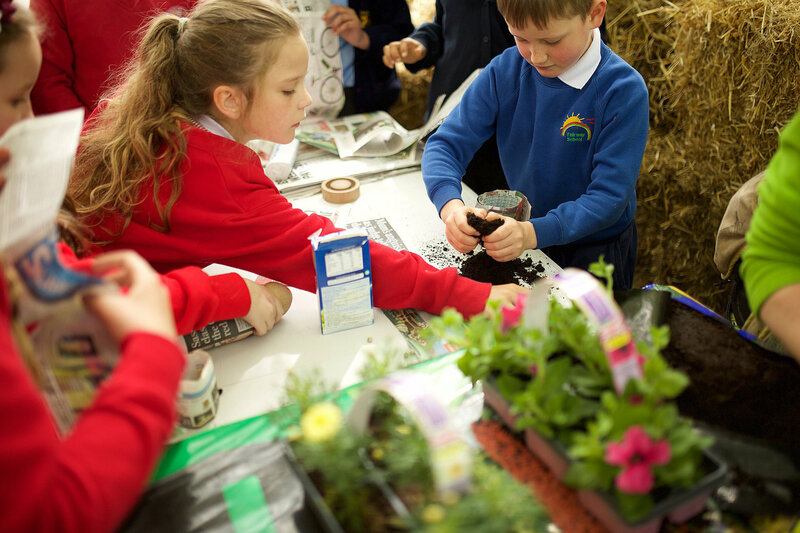 We then moved on to growing seeds in paper pots in which we touch on recycling, counting, measuring and percentages. We looked at the life-cycle of plants, what they need to grow, what makes a healthy diet and what parts of plants we eat. We also talked about food growing in history, and how ancient civilisations invented clever ways of growing food to keep their people alive. The next zone was the Grass Zone where we looked at the job of a Grounds Keeper or Gardener and what their job entailed. We asked the children about the PPE in this area and what they needed to protect themselves. Next, we discussed some of the tools used in this area such as large triple mowers and small hand pushed mowers then discussed the differences in size for job. We also discussed the difference in weight and the effects on the environment between the petrol and electric strimmers and blowers. Here we linked the demonstration to measurements between the mowers and the area each could cut and how long it would take them to mow a certain area. We then moved onto the Apprentice Zone where three apprentices from Stockport College were building bid houses for the schools and a bee hive. We brought the children into the marquee where they could witness the apprentices hammering, cutting and drilling. We asked the apprentices to talk to the children about apprenticeships and what they need from school. The apprentices told the children they chose to work in bench joinery and they all had full time jobs. They then took one day off a week to go to college and learn skills needed for that job. They also talked about what they needed such as maths to get on the course and that completing it will look good for job applications and also get them more money. We then encouraged the children to ask lots of questions to the apprentices whilst we also asked the apprentices some question from the children. This zone was good for the children to learn about apprenticeships from the apprentices themselves. After lunch, we then moved on to the Construction Zone, here we had an excavator and a dumper. We spoke to the children about the job of a plant operative and what PPE he needed to have. We then discussed the machines and the hand-tools on show. We then let the children into this area to climb on the machines and investigate the different materials. After all the children had a chance to sit in the seats of the machines and investigate them they then went back on the outside of the zone. We then discussed the different materials and why they needed to be a certain material for different reasons. We pulled both machines out and demonstrated each one moving. Whilst the machines were moving we asked the children how the boom moved up and down and how the dumper worked. The children suggested electric, we then explained to them about hydraulics and forces. Hydraulic cylinders get their power from pressurised hydraulic fluid, which is typically oil. The hydraulic cylinder consists of a cylinder barrel, in which a piston connected to a piston rod moves back and forth. There are a whole range of reasons why they use hydraulic oil such as lubrication, the prevention of rust and thermal stability. The next zone we visited was the Design Zone where Lee showed the children how we at Great Grounds design gardens and the programs we use such as Sketch Up and Indigo Rendering. He showed them some designs and discussed with them what Computer Aided Design (CAD) is and why we use it. We showed the children how you can get exact measurements which helps in the planning and costing of jobs. Lee McDermott then introduced Jo O’Raw from Lark Hill Nursery who gave a talk aimed at children and adults based around risk and challenge and allowing children to take risks in school. She spoke about how schools are becoming too protective and focused on attaining goals which is denying the children valuable learning on how to negotiate risk. The children then had some child initiated time in which we had planned a nature hunt. There was also time for them to revisit any zones and complete seed planting. 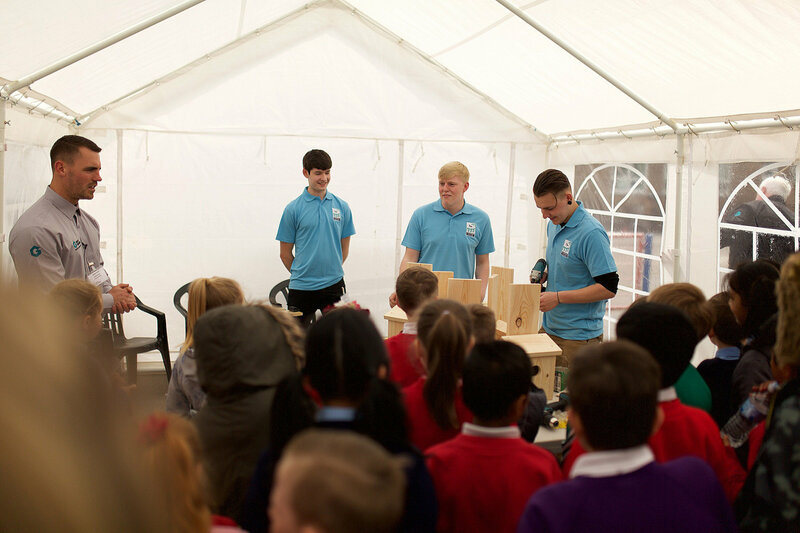 One positive outcome that came from the event was introducing children to apprenticeships and to help pupils make a connection between what they learn in the classroom and how it relates to the world of work. It was also beneficial for the children to talk to real apprentices and tradesmen from different trades with who they could ask questions freely. The children also learnt about health and safety and the equipment workers needed to keep them safe whilst working. Another positive outcome from the demonstration was linking what was on show with the curriculum in school. This provides the children with a real life link back to work they do in the classroom. One of the positive outcomes that came from this demonstration was the engagement of the children who sometimes have a hard time concentrating in the classroom. The demonstration was mostly hands-on and practical which engaged all of the children. 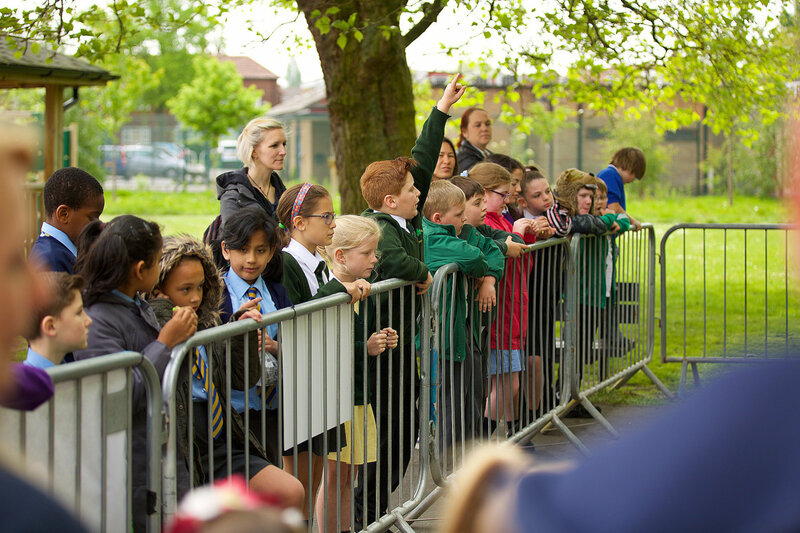 Great Grounds will be holding more school events in the future to promote teaching and learning outside the classroom. 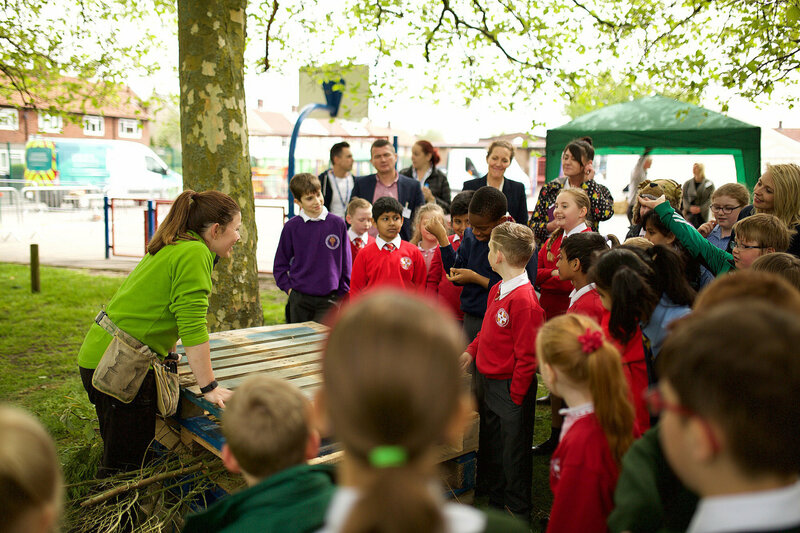 We also present smaller tailored demonstrations to suite individual school needs that can be based around a variety of outdoor projects and school outdoor improvements. We would like to give a special thanks to Julia Bramhall, Headteacher at Sacred Heart Primary School for allowing us to hold our event at her school. We would also like to thank Mandy Morrison and Jo O’Raw for helping in presenting their areas and a big thank you to all the schools who came to our first event.